I decided to write about pleated skirts because of the response I got this Sunday on my Outfit of the day Instagram stories where I was wearing a pleated skirt. 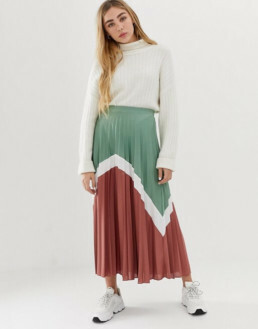 Pleated skirts are flattering because they usually have a high waist which means that your legs look longer and we all want that. It also gives you a nice hourglass shape because it’s tight around the waist and then goes down in an A-line shape. And you can wear them with any top (from shirt to turtleneck) and with any shoes (from sneakers to high heel boots).